Sometimes a company catches our eye, and even though we haven't met the folks yet or conducted any business with them, they are such an obviously valuable resource for our readers that we run a profile anyway. For professional woodworkers, East Teak Fine Hardwoods, Inc. is such a supplier. The company began in 1972 with a focus on the marine industry, and quickly became a supplier to superior manufacturers such as Sea Ray, Bayliner and Wellcraft. Then they changed the way boat builders placed orders with hardwoods suppliers. The old way was to buy rough-sawn boards that were processed by the builder in highly staffed, expensively equipped shops. East Teak offered finished custom mouldings and millwork on a just-in-time basis, creating dramatic efficiencies for its customers. After three decades of growth, East Teak now offers a wide range of hardwood species. In addition, the company works with architects, interior designers and builders to create such diverse projects as hotel lobbies and guestrooms, residences, the interiors and exteriors of commercial buildings - everything from boardrooms and courthouses to concert halls. 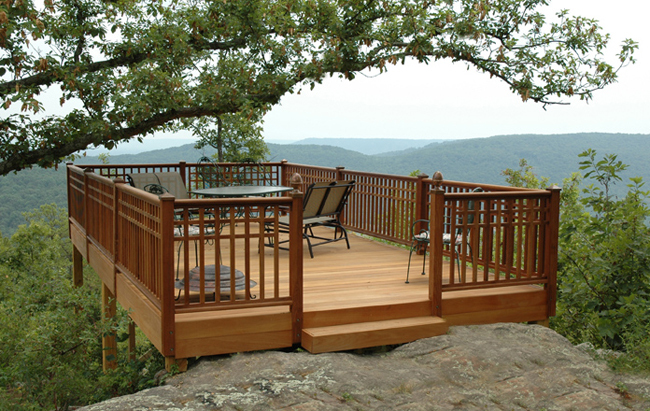 The Alabama deck shown above features Garapa Gold™ and with handrails in Ipé. Both species were supplied by East Teak Fine Hardwoods. Overlooking the Tennessee River, the deck was constructed by Brian Snider of Deckbuilders. From stairways and ceiling rafters to base shoe mouldings, East Teak has the in-house capabilities to mill and deliver custom woodworking needs. They use both a conventional planer and a Weinig six-headed molder to provide even, smoothly surfaced stock down to a minimum thickness of 1/8". They resaw, straightline and gang rip, so you don't have to. And they supply evenly dimensioned S4S stock to exact specifications. East Teak offers a wide range of top-quality certified hardwood products, including certified hardwood flooring, architectural mouldings and FSC® Certified Ipe. And for ecologically conscious hardwood lovers, the company has a distinctive but limited line of Forest Steward Council-certified, 100 percent post-consumer recycled Indian rosewood columns. They provide architects, builders and designers with an elegantly eco-friendly opportunity. Ranging from five to eight feet tall, they were recovered by hand from existing structures, thereby avoiding the need to fell living trees. 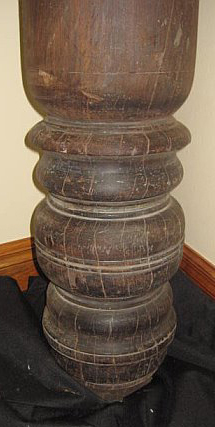 Each column brings the unique characteristics of decades of aging, which results in a very distinctive and durable product. The FSC 100 percent recycled label guarantees that the timber is harvested purely from post-consumer sources, to ensure the highest possible legal and environmental standards.